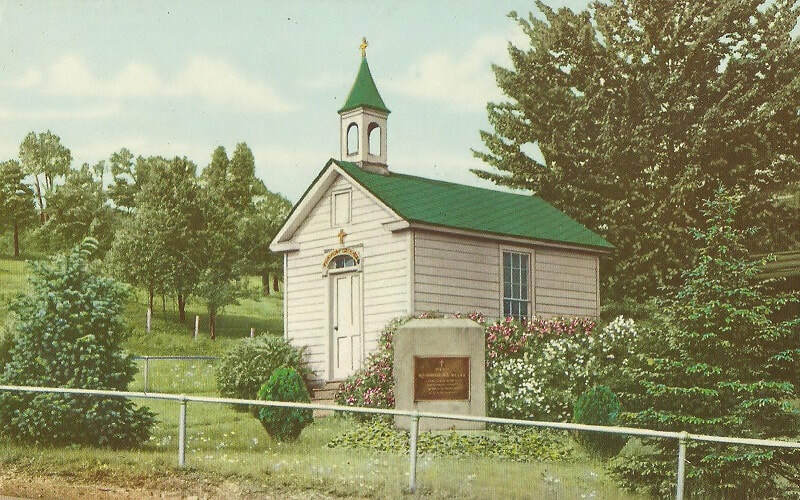 The story of Decker's Chapel is the story of German Catholic immigrants who came to North America and colonized the wilderness of Northwestern Pennsylvania at the beginning of the 19th century. A family named Decker arrived in America from Parsberg, Bavaria, Germany in 1846 and settled in an area near what is now St. Marys, Pennsylvania. One day, while working in his orchard, the elder Michael Decker fell from a tree and injured his back. Deeply religious, he vowed that if the injury healed he would build and maintain a chapel. The injury did heal and the little wayside place of worship became a landmark of Elk County. Decker's Chapel is one of the smallest churches in the world. The original building was built in about 1856. A crude structure, it was renovated over the course of its existence into the picturesque chapel it is today. In 1928, a monument was erected in memory of Monsignor Michael Joseph Decker, the son of the chapel's original builder. Michael Joseph entered St. Vincent's College while still a child. Between 1850 and 1859 he would walk to the college and return home each spring where he would practice in the little chapel. In 1862, he was ordained for the priesthood in Brooklyn, New York. Over 2,000 people attended the mass and dedication ceremony on September 23, 1928. In 1955, the Knights of Columbus who had served as custodians of the chapel for more than 25 years, electrified the building for the first time. An original descendant of the Decker family deeded the chapel to the Elk County Historical Society in 1990 and, in 1998, it was added to the National Register of Historic Places. Decker's Chapel underwent a major renovation, which was completed in 2016. The original stacked stone foundation was repaired and the floor reinforced to accommodate visitors in wheelchairs. The St. Marys landmark is open every day, year-round. Visitors are encouraged to visit this quiet place of prayer and reflection and sign the guest book, which has included pilgrims from around the globe.